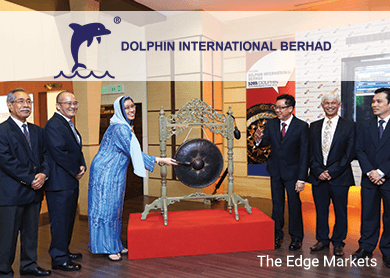 KUALA LUMPUR (June 9): Dolphin International Bhd jumped as much as 16% on the palm oil mill manufacturer's maiden trading day on Bursa Malaysia's Main Market today. Dolphin (fundamental: N/A; valuation: N/A) shares, which were listed at 68 sen each, jumped as much as 11 sen to 79 sen.
At 11.36am, the stock reduced gains at 73 sen with some 45 million shares exchanged, making it the most-actively traded entity across the bourse so far today. Speaking to reporters at the listing ceremony, Dolphin group managing director Eric Low Teck Yin said the group had an order book of about RM168.67 million, which should last until the end of 2016. Low said Dolphin was targeting oil palm plantations across Malaysia and Indonesia. Dolphin's clients include Boustead Holdings Bhd and Felda Global Ventures Holdings Bhd. "Moving forward, the group (Dolphin) will continue to focus on Malaysia and Indonesia, which supply 90% of global palm oil needs," he said. On Dolphin's outlook for financial year ending December 31, 2015 (FY15), Low said it was looking at maintaining, if not improving, earnings from FY14. In 1QFY15, Dolphin recorded RM10.62 million in revenue and RM3.11 million in net profit. "We expect to be able to maintain our earnings track record from what we have disclosed before. This year, we are looking to maintain or improve," he said, without elaborating. According to Low, Dolphin's listing is a significant event that would push the group to achieve its dream of being a leading player in the palm oil mill manufacturing sector. Dolphin's rivals include names like CB Industrial Product Holding Bhd.